Cyprus Property Blog by Cleo : Fantastic Luxury Villa in Sea Caves Area - NOW SOLD! The Most Luxurious Villa in Paphos! • 545 sq. m., 7 bath, 6 bdrm 2 story "Stunning Design" - €1,900,000 EUR - All the bells & whistles! NOW SOLD! 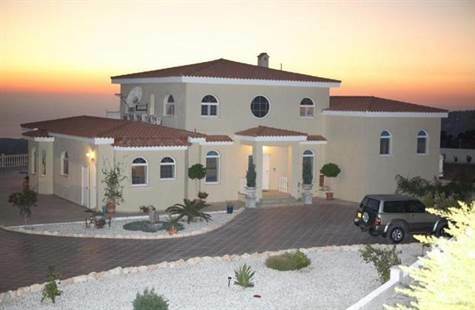 Akoursos , Paphos - This home is truly amazing in every way possible. You can live like royalty in this dream villa. The panoramic unobstructed views across Paphos, Coral Bay, the Akoursos Dam and the Cyprus mountains make this spectacular villa even more special. It is situated just 10 mins from Coral Bay, but remains private and exclusive. The villa features very high ceilings throughout offering light and cool living, top of line appliances and fixtures, great layout and design, awesome location and modern technology. The lounge is spectacular with 3 bays of windows including double French Doors to the pool terrace. The kitchen is unique and custom designed in solid, imported Maple with centre island. There is a seprate utility/laundry room, a pantry, granite counter tops, and maple cabinetry. The home features 3 separate indoor seating areas to enjoy. The villa has 6 bedrooms and 3 feature modern ensuite bathrooms. All rooms have LG Air Conditioning, fitted wardrobes, wall lights or dimmer switches and bat, thermostatically controlled showers, stainless steel towel warmers and much more. One bedroom has double french doors leading to the lower courtyard. Another two bedrooms each have French doors leading to private terraces. The master suite has a huge walk-in, fully fitted dressing room. A private evening lounge is attached to the master suite and each room has large double doors leading to a huge private terrace. The master bathroom has a huge thermostatically controlled walk-in shower, large bath with thermostatic tap ware and double vanity unit. There is a separate office/study with fittted bookcase, display cabinets, desk units and windows to 2 aspects. Outside is fabulous for entertaining with a 1800 sq. feet sunken courtyard that could even hold a wedding party and a lawn area that would be ideal for tennis courts. There is a 12x6 Spanish Ceramic tile vanishing edge pool, a waterfall, an outdoor bar, 8 person jacuzzi, bbq area and much, much more!